Carl Small and staff outside the factory in Lismore. TODAY most furniture in our local shops has been made in factories many miles away, possibly even in other countries. However, in the late 19th and early 20th centuries it was more normal for the furniture to be made locally. In Lismore Brown & Jolly, and later Carl Small Furnishings, were probably the most successful in this field. While Brown & Jolly also built houses Carl Small concentrated on furnishings. Carl Small was born in Ulmarra in 1898 the son of Herbert Thomas and Barbara Elizabeth Small (nee Grebert, previously Marcolino). The Small family were pioneers in the Clarence River District as shipping and cedar agents and later as squatters. Carl's father inherited one of his father's properties but later sold most of it so he could concentrate on his first love - the breeding of fine horses. Carl was the eldest son but was not particularly interested in either the land or horses so, when the First World War began, he could not wait to enlist. He was only 17 and knew that he would be known in Grafton so he cycled to Lismore and enlisted there, giving his age as 21. His army papers say he enlisted at Bathurst in 1916 but apparently he was sent there for initial training. He experienced some of the worst fighting in France and was gassed and wounded. He was awarded the Distinguished Conduct Medal for acting as a stretcher bearer. As most of the stretcher bearers had been killed he had volunteered. On his own initiative he organized others into stretcher parties and helped the wounded, many times going out into the firing line. His Medal was presented to him by King George V. Carl met the King again when he was a member of the King's Guard of Honour at the opening of Australia House in London in 1918. Returning to Australia in 1919 he took some time to settle. He joined the Police Force and in 1928 he married Mary Lorna (Molly) Navin in Sydney. On leaving the Police Force the young couple moved to Murwillumbah and then to Albury where he sold A.W.A. radios. 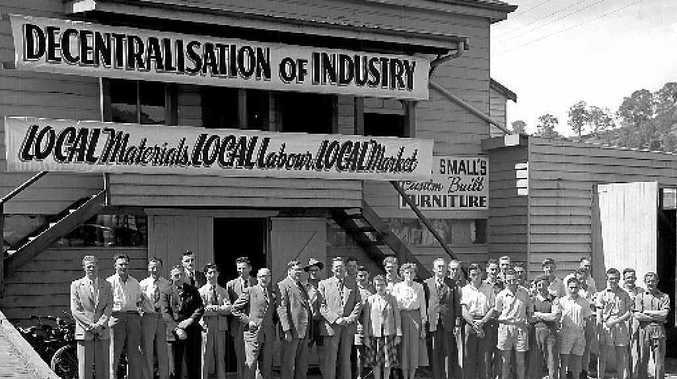 In 1936 they came to Lismore where Carl decided to open a furniture store in Magellan Street. He also became the Sports Announcer at the newly established 2LM radio station. He was very interested in the community, was a keen sportsman and joined various organizations including the Lismore Musical Festival Society. He was elected an Alderman of Lismore Council. He became very interested in water conservation and irrigation and it was largely because of his efforts that the Richmond Valley Development Association was formed. This Association's activities led to the office of the Water Conservation and Irrigation Commission being set up in Lismore. In the late 1940s there were difficulties in obtaining supplies so Carl Small extended his business to include the building of fine furniture. The factory also supplied stores in Sydney and elsewhere throughout the State. By this time his son and daughter had both joined the business. The daughter, Moira, had become a qualified interior designer. She therefore managed interior design and soft furnishings. Later she was to establish her own business in a separate building. He loved boats and always owned one, though his wife, Molly, complained that they always lived in rented houses. He therefore built a beautiful home at Goonellabah and took her on a wonderful holiday to the Barrier Reef in a new Yacht. He died in 1983 aged 84. His wife died in 1993. Both are buried in the Lismore Lawn Cemetery at Goonellabah.